While Georgia Sec of State Brian Kemp has declared himself the winner of the Georgia Governor’s race.? The count is still going on and Kemp’s lead is shrinking…. Oh, and Kemp is overseeing the vote and has had his office in court…..SEVERAL times…. Republican Brian Kemp’s campaign declared victory in the race for Georgia governor on Wednesday, even as election officials continued counting thousands of absentee and provisional ballots, narrowing his lead and prompting Democrat Stacey Abrams to insist she could have the votes to force a runoff election. As the vote-counting continued, voting rights advocates accused Kemp — who as secretary of state is Georgia’s top election officer — and local officials of disenfranchising thousands of voters on Election Day. Hundreds of complaints flooded in about hours-long lines brought on by broken equipment, a shortage of voting machines and insufficient quantities of printed provisional ballots. On Wednesday evening, Kemp was ahead with 50.3 percent of the vote to Abrams’s 48.7 percent. 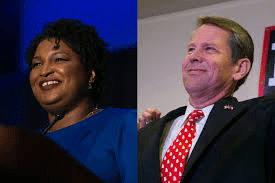 Abrams and the Libertarian candidate would need to gain at least 25,000 votes more than Kemp to bring his share of the vote below 50 percent and trigger a runoff.